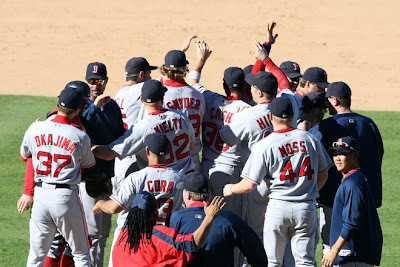 The 2007 World Series Champion Boston Red Sox!!!! Josh Beckett: You pitched so well all year, then you turned it up a notch for the post season. When we went down 3-1 against the Indians your start was the one beacon of hope that kept us all sane. You turned the tide, you did everything we could've asked of a pitcher and more. Hideki Okajima: You made it interesting those last two games, but you were our workhorse in the bullpen all season long. Every time you came out late in the game in a close game we felt good because we knew you were throwing everything you had into every single pitch. Through hard fought inning after hard fought inning Dice-K's stable pony became the stud and we love you for it. Jonathan Papelbon: You were truly born to be a closer. Your tremendous energy and exuberance brings a fun quality to the game that really makes it worth watching. We've watched you flourish from a promising young prospect in the minors to one of the most dominant closers in the game. Dustin Pedroia: How stupid do we feel after we asked Terry to sit you down for Alex Cora early in the season. Those first few months must have been really tough up at the big ball club, but you never let that get to you and you fought and ground out at bats and somehow managed to bounce back to finish the season with numbers that make you worthy of Rookie of the Year consideration. Jacoby Ellsbury: I remember when a friend of mine who's more familiar with the Red Sox farm system told me about you. I thought he was exaggerating, your ability to get big hits, your defensive skills, your speed on the basepaths. Minor league stats! Little did I know you were even better than advertised. When you finally got that spot in the ALCS it seemed like every time the Red Sox needed a boost, there you were to give it to them. I am really going to enjoy seeing what you can do in a whole season up at the big club. Manny Ramirez: You make every pop fly to left an adventure, feel the need to flip of your helmet every time you run the bases and sometimes it seems like you don't care; but I know we never could have done it without you. There were times where your bat just carried our team through the tough times. That three-run walkoff homer against the Angels was huge. Big Papi: Maybe the numbers were down this year, but everybody knew you were playing through alot of pain. Even through all of that, your presence at the plate never wavered, you still came through with big hits throughout the post season. I can't wait to see you bounce back from knee surgery and see you come back strong. Mike Timlin: You did more than any of us could have expected this year. Brendan Donnelly was supposed to be our setup man, but that didn't work out, then it was supposed to be Eric Gagne, but that didn't work out, then the job fell to you and Manny Delcarmen and you came through when it mattered. You were great in the second half and great in the post season. You filled the gap between the starters and Okajima so well. Kevin Youkilis: You were just great all year long. No longer are you the Greek God of Walks, you still get a decent amount of walks, but you've become a dangerous hitter. You got hot at the plate at just the right time, to the point where I was claiming your bat to be more indispensable than Big Papi. Your defense has been gold glove caliber all season long. Mike Lowell: I'm not sure if you'll be back, the Yankees might make you an offer you can't refuse. The Red Sox also might decide that the money is better spent on the likes of Alex Rodriguez now that the Yankees are no longer available for a bidding war. Just like with Johnny Damon, I won't like it, but I'll understand. You came to us as a throw-in with Josh Beckett, but you've been every bit as valuable. We all knew you had great skills with a glove at third base, but we didn't know you were going to have such a potent bat. With Ortiz and Manny having down years your bat made up the difference and earned you the love and respect of the Boston faithful. JD Drew: Thanks for the grand slam and some nice hits in the post season. Julio Lugo: Thanks for some nice hits in the post season and not making one too many errors against the Indians. Coco Crisp: Thanks for a solid season and not making a fuss when you were benched for the rookie. I'll always remember that smile on your face as you hobbled to the dugout after catching that pop fly to end game 7. I wish you luck wherever you end up next year. Jason Varitek: Real fans know that what you did with the pitchers this year and your leadership in the clubhouse was the real contribution more so than your bat or your defensive skills. Thanks for another solid year. Bobby Kielty: Thanks for 1/1 HR in Game 4. You didn't know it at the time, but that was the difference. Way to make it count. Dice K: I know everybody's saying they overpaid for you, but that's what they said about Josh Beckett last year. Considering that Beckett went 16-11 his first year in Boston 15-12 doesn't look so bad. I expect big things from you next year. You gave us what we needed in Game 7 when everybody thought you couldn't do it. 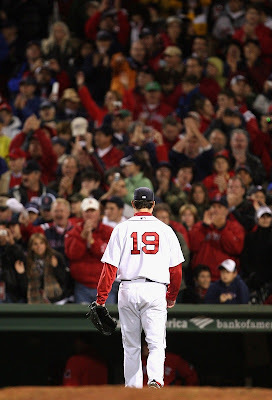 Curt Schilling: I hope it's not, but if this is your final game in a Red Sox uniform, thanks so much for everything. It was amazing to see flashes of brilliance like your near no-no in Oakland and the extra gear you seemed to kick it into for the post season. Your physical tools aren't what they used to be, you recognized that and you worked around that and managed to be effective anyways. Jon Lester: You might be THE feel good story on a team full of feel good stories. 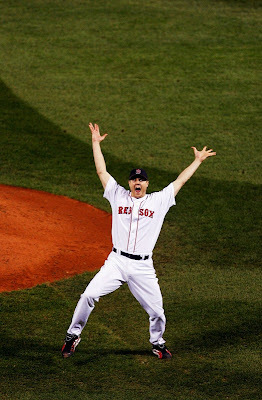 We were all inspired by your fight to beat cancer when we weren't sure we'd ever see you in a Red Sox uniform again. Yet, there you were in Game 4 pitching your heart out and getting out of some tough jams. You never complained when you were done rehabbing but Tito stuck with Julian Tavarez and showed some real class. I'm looking forward to seeing you as an every day guy next year. Clay Bucholz: It's a shame we didn't get to see you dominate the post season the way you did in the regular season. Your no hitter was a true inspiration coming from a pitcher making just his second big-league start. I can't wait to see what you can do next year with a whole year at the big leagues to work with. Julian Tavarez: You were just a mini-Tim Wakefield this year. You did everything we needed. Need a spot start on short rest? Why not Julian? Need a long reliever? Why not Julian? If we needed a closer I'm sure you would have been up to the task and done a halfway decent job in the process. Your versatility, your performance and your humble attitude were crucial. Tim Wakefield: I think Mike Timlin said it all when he butted into Tim Wakefield's post game interview after Game 4 of the World Series. This win was all about you. You've been with us for so long it's hard to imagine what it'd be like to have Red Sox baseball without you. You had a great regular season. I can't imagine how hard it was for you to admit you were too banged up to pitch in the World Series, but you put the team ahead of your own personal wants and allowed John Lester to go out there and pitch a great game to wrap up the series. I sincerely hope the Red Sox can see what a bargain it would be to pick up your option for another year. With your versatility there's no way it won't be money well spent. Terry Francona: You do such a great job of managing in a town where it's so tough to be a players manager. There's a million people second guessing every move you make when you manage the Red Sox, and you always respond with respect and professionalism. When Red Sox nation was calling for your blood after Game 4 of the ALCS, you kept a cool head and you stuck by your guns. Not an easy thing to do. Royce Clayton: Thanks for showing us the way to dupe Taco Bell out of additional free tacos. Is there any way we could NOT give Eric Gagne a WS ring? Who Sits and Who Hits? Terry Francona has made a tentative decision to sit Kevin Youkilis for game 3 and David Ortiz will take his spot in the field at 1st base. Jacoby Ellsbury will be moved into the leadoff spot and Dustin Pedroia will be moved into the #2 spot in the lineup to replace Youk. I'm not sure I agree with this decision. Have a look at the numbers for the ALCS and World Series for Kevin Youkilis, David Ortiz and Mike Lowell. You don't need to tell me about how clutch David Ortiz has been in post seasons past, but Youkilis is swinging the hot bat right now, I'd like to ride that until he cools off a little. Consider who would benefit most from the additional rest. Ortiz is pretty banged up right now, some time to heal would allow him come back with a vengeance when/if the series returns to Boston. Let's not forget that Big Papi can still pinch hit. How great would it be for a pitcher to think he's one Julio Lugo ground out away from getting out of a jam only to have David Ortiz stroll up to the plate instead? One of the most clutch hitters in baseball history hitting in only the clutchest of situations? That's what I call a psychological edge. I don't place a high priority on fielding, but it's still something that should not be ignored. Youkilis and Lowell are both Golden Glove caliber fielders at their positions. Big Papi with his bad knee, complete lack of speed and rust from not having played the position for quite some time is a serious liability. Last time the Red Sox played a first baseman with a bad leg in the World Series he made a costly error. His name was Bill Buckner, perhaps you've heard of him? I just want to clarify something here. This win had less to do with Matty Ice getting it together in the fourth quarter and more to do with the excellent Eagles defense and special teams. They won't be properly recognized, but the heroes of this game was the stingy Eagles defense that held the Hokies to only 10 points all game and kept the game within striking distance while Matt Ryan was posting 3 and out after 3 and out. Keeping the Hokies offense under wraps all night in their home stadium with the offense floundering was no small task and they were up to the challenge. Eagles punter Johnny Ayers might have been the real MVP behind center as he buried the Hokies deep in their own territory multiple times throughout the course of the game. Even Sid Vicious came through with an onsides kick that was recovered by the Eagles and gave Matt Ryan ample time to march down the field. That said, I was impressed by Matt Ryan's ability to get temporary amnesia, forget the terrible game he had played up until the fourth quarter and came up big when it counted. Despite the fact that this was easily his worst game of the year, experts seem to think that his clutch performance in the 4th Quarter will highlight his resiliency and supplement his Heisman credentials. This was a huge game for the Eagles. The biggest criticism of the Eagles this year had been that they simply hadn't played against any good teams. With a win over a top 10 team on the road it's going to be harder for the experts to make this argument. The Eagles are in a strong position to go to the ACC Championship and possibly national title game if they can avoid the upset in the 4 trap games that round out their schedule. The Atlantic Division of the ACC is a bit thin. Wake Forest is second in the division with one loss and will need the Eagles to lose two of their remaining four games as the Eagles would win a tie-breaker scenario as a result of their win in the opening week of the season. Florida State and NC State have both been eliminated for all intents and purposes with 3 conference losses each. Clemson and Maryland both have two losses in the conference, but one will knock the other from being a realistic contender as they play this week. After this weekend's games there should be only two teams within striking distance of the Eagles. It might be a bit optimistic to talk about the national title potential with some strong opponents still on the schedule, but it's looking to be a distinct possibility. The Ohio Buckeyes have the top spot for now, but they've also been getting fat off of cupcakes in the schedule and they're approaching the meat of they're schedule. They'll need to beat Penn State in Happy Valley, A Wisconsin team that had been ranked highly at one point in the season, An Illinois team that upset Penn State and Wisconsin in back to back weeks and finish off the season in Ann Arbor, Michigan where the Wolverines seem to have bounced back nicely from their struggles early in the season and is now ranked at #20. LSU is back near the top of the rankings after dropping from a loss to Kentucky two weeks ago, but the critics love this team with a passion and a last second victory over #17 Auburn was reason enough to bump them back up to number 3. The Tigers have their last real challenge of the year against #24 Alabama in Tuscaloosa and will wrap up the year with what should be 3 easy games. If LSU manages to win all their remaining games I could easily see LSU leapfrogging the Eagles in the rankings....at which point I'm going to be very busy writing alot of angry letters. I'm going to need some recovery/digestion time to let the gravity of last night's contest set in. If you missed the BC Eagles v. Virginia Tech game, you can see the part that matters below. Let me set the stage. BC's offense had been horrific all day long, Virginia Tech's offense wasn't much better, but they had been able to put up 10 points. The Eagles finally scored with little time left in the fourth quarter, managed to convert an onsides kick to get the ball back, that's where this video picks up. After a horrendous showing by Matt Ryan that looked like it was going to bring an end to the Eagles undefeated season, the end of their national title hopes and the end of his Heisman Trophy chances, on those last two drives he showed the 66,233 fans in Lane Stadium what all the fuss was about. U-N-B-E-L-I-E-V-A-B-L-E.
After the shock of that win I wasn't really able to enjoy the fantastic game the Red Sox were playing. Curt Schilling, Hideki Okajima and Jonathan Papelbon were better than good keeping the Rockies to just one run to give the Sox the 2-1 victory. I'll post some more about both of these games tomorrow sometime, after the shock wears off a bit. Me and the rest of the BC/Red Sox fans face a tough decision tonight. On the one hand, I have the Boston College Eagles. They're undefeated at 7-0 and are playing their biggest game of the year at Virginia Tech (6-1, 3-0 ACC). This is the legitimacy game. BC is ranked number 2, but this is more the result of Boston College being in the right place at the right time, alot of cupcakes on the schedule and the teams ahead of the Eagles continuing to lose. The Eagles have only two respectable wins to their credit at this point by beating Wake Forest (5-2, 3-1 ACC) in the opening game and an overrated Georgia Tech (5-3, 2-3 ACC) in week 3. This game has everything going for it: It's a matchup featuring two top 10 teams, It's against an ACC team and therefore has ramifications for the ACC Championship game and the Eagles need to run the tables to get into the National title game and this game is the biggest threat to the Eagles going undefeated. This will also have a huge effect on Matt Ryan's Heisman trophy chances. If the Eagles win this game it could be the biggest season for BC football since a guy named Doug Flutie was behind center and I was in diapers. How many times does one get the opportunity to see the Red Sox compete for a World Championship? Sure, we got one back in 2004, but there was a pretty big drought before that if I remember correctly. It could be a while before I get to see the Red Sox on the biggest stage in baseball again. If Curt Schilling and the Red Sox bats get it done tonight it could be the beginning of the end for the Rockies. So what do I do? No doubt the World Series is a bigger deal than BC-VT by itself, but is one game of the World Series bigger than BC-VT? How do I eat, sleep and drink Red Sox but bleed Maroon and Gold? Which game gets my attention and which game will I Tivo and desperately try to avoid hearing the score of? 1) Turns out none of the thirteen runs the Sox scored last night carry over into tonight, or any of the other 6 potential games in this series. The Red Sox lit up CC Sabathia to open up the series with the Indians, but that didn't prevent them from winning the next 3 games. 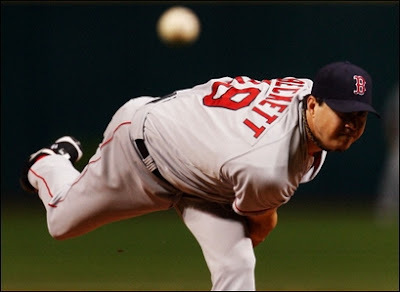 2) Josh Beckett will probably only be able to make 1 more start, so I hope you enjoyed it. Apparently some of our other pitchers are going to have to win games if we're going to win this series. 3) After tonight's game, the Red Sox are going to have to travel to the mile high city where hit baseballs carry just a bit more. Maybe some of those wall ball doubles the Rockies hit last night will turn into home runs. Also, the Red Sox will have to sit either Big Papi, Kevin Youkilis or Mike Lowell in Colorado; all of which have been key contributors in the Red Sox lineup all year. In order to get Papi's bat they'll have to take his glove and his bum knee as part of the deal and lose either the golden glove caliber skills of either Mike Lowell or Kevin Youkilis. I hate to say this, but it might be better to have Papi on the bench as a pinch hitter rather than take another potent bat and good glove out of the field. At least that way he'll be rested by the time it comes back to Fenway. 4) Clearly the Rockies lost a step from their eight days off. Jeff Francis looked terrible and the timing of the Rockies hitters looked way off as they tried to hit Josh Beckett. They're due to get their groove back pretty soon. 1) There was some concern about whether or not the Rockies knew how to hit Josh Beckett as they were able to give Josh his first loss and worst outing of the regular season. They looked pretty lost trying to hit Beckett last night. 2) The Rockies had to plow through a large portion of their bullpen to eat innings. With no off day this could affect their availability or effectiveness for tonight's game. 3) I think it's nice psychologically to break the Rockies of that confidence they probably had from their unbelievable winning streak. Not only did they end the streak, they ended it with authority. 4) A win tonight ensures that the Rockies will need to win at Fenway to win the series. Maybe you can never really quantify it, but homefield advantage is a beautiful thing. This pitching matchup occurred before on June 14 at Fenway and ended in a 7-1 loss to the Rockies. Looking at the box score, it seemed like the Red Sox should have had a better game than one run. Mike Lowell, Jason Varitek and Manny Ramirez all had 2 hits and everybody in the lineup but David Ortiz and JD Drew had a hit. Jeff Francis was pulled after 5 innings and gave up no runs whatsoever. Beckett, on the other hand, gave up more earned runs than he had all year and recorded his first loss for the year. 3rd baseman Garrett Atkins was the game's hero hitting a grand slam in the third inning to give the Rockies a 5-0 advantage. Matt Holliday would hit a 2 out solo shot in the fourth and went 2 for 5 on the day. A few other Rockies also had good days at the plate. Atkins would finish the day 3 for 5, 2nd baseman Kaz Matsui would also go 3 for 5 on the day and the catcher Yorvit Torrealba was 2 for 4 for the day. The impression I got of this game was that Beckett temporarily reverted back to his 2006 form being susceptible to the long ball, something he has improved upon dramatically this season. Francis was somewhat lucky in his ability to get out of jams as the Red Sox hit him well but couldn't seem to come through with clutch hits. 1) Matt Holliday: He's the NLCS MVP and finished near the top in the NL in every offensive category. Ironically his batting average and OBP in the post season are significantly down from his regular season and career numbers going only 8 for 28. Why all the fuss? 4 of those 8 hits were homeruns. 2) Hawpe, Torrealba and Matsui: These three guys have been the heart of the Rockies offensive production in the post season. They have been an excellent supplement to Holliday's bat by doing a great job of getting on base and coming through with big hits in the playoffs. Together they've drawn 14 walks, put up 17 RBI's and a combined 24/77 hitting. All three of these hitters were below .300 hitters for the season. If the sox pitching can snap these guys back to reality the rest of the lineup is hitting below .200. 3) Feeling rusty or rested? The Rockies have had a record 8 day layoff after sweeping the Diamondbacks in 4 games. Different teams and players react differently to long layoffs. They may react well to the additional rest to heal and prepare, or they may be caught flatfooted with their timing off trying to catch up to a Josh Beckett fastball. The Rockies have attempted simulated games to stay sharp. If Beckett comes out throwing fire and they're not ready for it, it could be a long night for Rockies hitters. Tim Wakefield to be left off World Series roster! The Red Sox held a press conference today to announce that Tim Wakefield would be left off the World Series roster due to his injuries. Wakefield was the only Red Sox pitcher to record a win against the Rockies during their interleague series against them in mid-June. The Red Sox lost the 3-game series 1-2 with Beckett and Schilling taking the losses. Unlike in the Indians series, the Red Sox do not have the option of pitching Beckett on short rest game 4 and then having him make a start in game 7 on full rest. Although the Red Sox didn't mention him, Julian Tavarez is also an option for a fourth starter, but I think he would be put to better use to take Lester's spot as a long reliever/meltdown insurance plan in the bullpen. The number suggest that Tavarez is more effective his first time through the lineup and becomes less effective in subsequent times through the lineup. They also announced that Jacoby Ellsbury will be starting in center field in place of Coco Crisp. I strongly support this decision as Ellsbury is swinging a hot bat lately and his defensive skills and speed on the basepaths are comparable to Crisp. Coming into this game I was under the distinct impression that this was a classic trap game. Normally, for a trap game the underdog has to be underrated, the favored team is overconfident and is caught off guard by the underdog. Normally there has to be some sort of semi-relevant statistic that gives the factual basis for this concern. For this game the fact that I kept on thinking of was 0-21 @ Miami losing to the Dolphins last year. What I forgot, however, is that these are the '07 Patriots and they are the 0-7 Dolphins. It's pretty hard to underrate an 0-6 team like the Dolphins and even harder to underrate an 0-7 team. As for the Patriots, clearly Tom Brady hasn't forgotten the embarrassing blemish on last season's record and seemed to be out for blood as he spread the ball around and racked up 5 TD passes IN THE FIRST HALF!!!!! Coming back from the locker room with a 5 touchdown lead much of the Miami crowd decided to beat the traffic and the Patriots were playing as though they had bigger fish to fry and couldn't wait for this game to be over. By the time the 4th Quarter rolled around, Bill felt it was time to take it easy on them and threw Matt Cassel out there to eat up some clock. Of course Matt quickly threw an interception that was returned for a Touchdown. The Patriots sideline immediately went into crisis mode as the Dolphins were now only a mere 21 points behind in the 4th Quarter. Bill had Tom Brady get suited up again and ran him out there to put another 7 on the board and put the lead a much safer 28 points away. When asked about running up the score on the Dolphins by bringing Tom Brady back into the game, Bill denied this vehemently. "I did it because of the score," Belichick said. "One more turnover, and then it's a 14-point game in the middle of the fourth quarter." This was a game only in the academic sense, game usually implies the possibility of failure, this was a slaughter. The Dolphins can now race against St. Louis Rams for worst record in the league and 1st pick overall in next year's draft. The Patriots on the other hand have bigger goals. Think they gave Don Shula in the stands and his undefeated 1972 Dolphins squad something to worry about? Next week the Patriots will take on the Redskins with it's very well earned 4-2 record at Gillette Stadium. The 'skins have had a tough schedule and are one of the elite teams in the NFC and in a tough division with Dallas and the Giants. They're a good football team, but probably not good enough to beat the Patriots, but then again who is? Elsewhere in the League: I think Jacksonville has a real shot against the Colts on MNF. The Broncos caught the Steelers with their pants down and pulled out a last second 50 yard field goal for the win. The Steelers have some real talent on their roster that gives them the tools to compete with the best teams in the league, but they seem to have some trouble with consistency. Buffalo pulled off an upset against the Ravens and now solidly possess the #2 spot in the AFC East at 2-4. In related news, the Patriots magic number is down to 6, they could potentially clinch their division by week 11. I am almost in shock after tonight's game. All the signs were in place for things to go wrong. Daisuke Matsuzaka looked terrible in all of his post season outings and I had nightmares of Daisuke melting down and Josh Beckett warming up in top of the first inning trying to squeeze a few more innings out of his tired arm to keep our World Series hopes alive. Manny Ramirez and David Ortiz weren't hitting. Jake Westbrook was getting out of jam after jam after jam thanks to his incredible knack for inducing double plays and found his groove later in the game keeping the Indians close the way he did in Game 3. This is normally where the Sox give up two runs on stupid mistakes like Julio Lugo missing a routine pop fly or Julio Lugo failing to turn an easy double play or Julio Lugo making a costly baserunning error to assist an Indians double play and pack it in for the season...but not tonight. Tonight the Red Sox found their second wind late in the ball game and pounded on the Indians bullpen to turn a tight 3-2 game into a full fledged blowout and Julio's miscues will forever be swept under the rug of victory. I guess we found out where those Dustin Pedroia hits were hiding as he slammed in a 2-run homerun to give the sox the 3-run cushion they needed to breath easy, then slapped a 3-run double in the eighth to put the game out of reach and prompt Big Papi to get his goggles on. 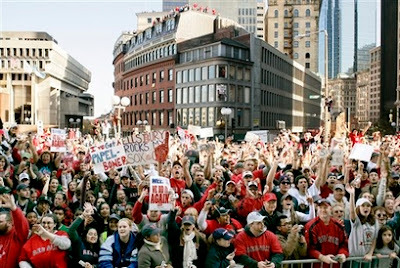 Any Red Sox fan who tells you that their confidence never wavered when they went down 3-1 isn't a true Red Sox fan. The 2004 season was an excellent band-aid, but deep down we can't forget the chokes of post seasons past. Every big game makes you think this may be the first chapter in a new century of Red Sox playoff woes. Few things compare with the feeling of Coco Crisp catching that ball and running into the wall, but still springing up and hobbling to the dugout with a smile on his face, because now he knows that feeling too. Maybe the Rockies will come into Fenway on Wednesday well rested and blazing hot and destroy the Red Sox hopes of winning another championship, but for tonight the Red Sox can sleep easy knowing the Rockies are going to have to come to Fenway, where Josh Beckett will be waiting for them. There is so little about the Red Sox you feel like you can rely on this year. Curt Schilling, Tim Wakefield, Dice-K, Dustin and even Manny and Big Papi have been consistently inconsistent all year. Fortunately for the Red Sox faithful, Josh Beckett isn't on that list. He was solid all season and seems to have turned it up a notch for the post season as he posts one lights out performance after another. It's no wonder the fans were calling for Tito's blood after putting Tim Wakefield in rather than Beckett on short rest for Game 4, who wouldn't want 3 appearances this series with the way he's been pitching lately? The other Cy Young candidate CC Sabathia paled by comparison as the sox once again got to him early and often. If one wasn't familiar with their bodies of work, one might assume that Byrd and Westbrook were the dual aces on the staff rather than Sabathia and Carmona based on their performances in the ALCS. There's something comforting about the Red Sox situation right now. It would have been easy for the Red Sox to get swept in Cleveland, but now they've grabbed the momentum back, and if the Indians want to go to the World Series they're going to have to come to Friendly Fenway and stump the sox in front of a raucous home crowd. If they can do that then maybe they deserve to go to the World Series. Curt Schilling will have a chance to add another chapter to his volume of post-season lore in Game 6 on Saturday night. The sox were able to get to Fausto Carmona in game 2 and pushed it to extra innings before Eric Gagne and Javy Lopez teamed up to blow it, with any luck they'll be able to get to him again and Curt Schilling will turn out a better performance this time around. Fortunately for the officiating crew, their botched call of what was clearly a Manny Ramirez Home Run will get swept under the rug as the extra run was inconsequential given the 7-1 final score, but I'm still upset about it, at the time it was still a very close game and another run could have been the difference that ended a season of baseball. The officiating this ALCS has been terrible, especially the balls and strikes. The strike zone hasn't been consistent at all. I've heard arguments that a more technological instant replay approach to baseball would ruin the flavor of the game, but there's nothing more irritating than calls that stand that were clearly incorrect when seen on replay like Manny's homer tonight or when it seems like an opposing pitcher is getting questionable strike calls and your pitcher isn't. The technology is there, it makes no sense not to use it. The University of South Florida Bulls, this year's Cinderella story in college football, which had scraped and clawed it's way to a perfect record and #2 in the AP Polls lost to Rutgers Thursday night. This will finally bring an end to the speculation that the Bulls could run the table, post a perfect record and shock the college football world by going from an unranked program to national title contender in the course of a year. This is good news for Boston College as they should move up in the rankings over the weekend as a result. This has been the overall theme of BC's season, advancing in the rankings not because they're winning, but because the teams in front of them continue to lose. If the scrappy Michigan State Spartans can pull out a win over the #1 Ohio State Buckeyes BC might be able to jump from 3rd to 1st in the bye week. The time between the end of this meet and the deadline was like two hours, throw in the drive home and I was in a rush. I scraped this thing out from my notes/recorded interview with the coach in about 45 minutes. Not my best work, but I'm glad to see it still made it to print. I was told once I'd put in some time on this stuff I'd be able to move onto more relevant/entertaining sports, I personally hope this comes about sooner rather than later. 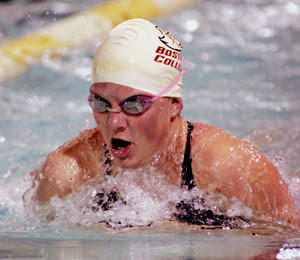 I came at this assignment with a positive attitude, but have you ever been to a swim meet as a spectator? It's like a louder version of watching paint dry. I respect that fact that the sport relies heavily on perfecting technique, but to a casual observer in the stands it just looks like swimming back and forth alot. BC came into this game the heavy favorite, ranked unanimously at #4 in the country and sporting an undefeated record more than halfway into this season. The Irish, on the other hand, have had a terrible start and now hold an embarrassing 1-6 record in what has been written off as a rebuilding year. Despite this disparity between one of the most notable rivalries in college football, the BC fan base was up for this game and many made the trip to South Bend to see the game. The campus was a ghost town this weekend and an eerie silence overtook the mods, the hub of BC's nightlife. BC didn't disappoint as they rolled to a 23-14 victory. A few quick observations about the game. 1) Matt Ryan threw alot of passes over the heads of his receivers, but he still put up some respectable numbers on the day and the win helped him further his Heisman aspirations. 2) Ryan bounced back well from the interception he threw that was returned for a Touchdown, I like that kind of unflappable confidence, or as he termed it "temporary amnesia". 3) The Irish seem to be figuring themselves out. Their backup junior quarterback Evan Sharpley played sharpley (I couldn't resist...sorry) after he took over for starting quarterback Jimmy Clausen. 4) BC running back Andre Callender had another good game for the Eagles, it's nice to see the run can get it done when the defense is keeping Matt Ryan from making big passes. Next week's game against Virginia Tech will be a real test for the Eagles. The Hokies were the victims of 48-7 shellacking by LSU down in the Bayou, but other than that they've been a very strong team. They put up an impressive win against Clemson two weeks ago and have clawed their way back up to 12th in the polls and are tied with Virginia at 3-0 in the coastal division of the ACC. Wins don't come easy out of Blacksburg. This was easily the best win for the Patriots this year. They downed a 5-0 team on their home turf. They didn't get lucky. 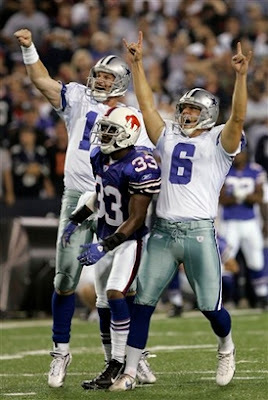 Romo seems to have worked out the kinks from the 5 interception game on MNF against Buffalo. His only interception came late in the game and was the last nail in the Cowboys coffin at that point. 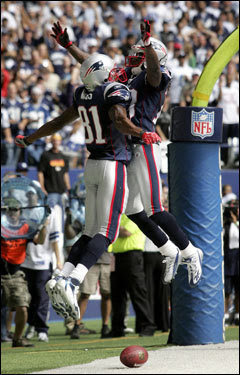 The Patriots also had an acrobatic Randy Moss TD pass downfield be overturned on review. The Patriots managed to overcome a big mistake by Tom Brady giving away 7 points on a strip sack. Despite the mistakes the Patriots ground out a well earned, convincing win. As for TO? He put up a respectable 6 catches for 66 yards and had a TD catch and did put up a slightly better day than the "Other 81" Randy Moss who had 6 catches for 59 yards and a TD catch. Moss wasn't really the story as Wes Welker and Donte Stallworth cleaned up with the backfield more open thanks to the Moss double team. The AFC East continues to be abysmal outside of the Patriots as Miami dropped to 0-6 this weekend and the Jets are still 1-5. Buffalo had the bye this week and occupies the #2 spot in the division at 1-4. The Patriots magic number is now 7. 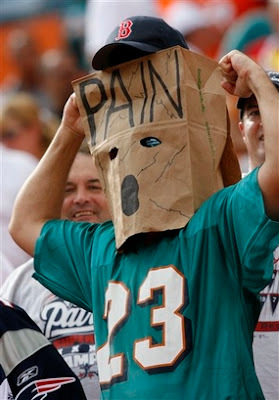 The Patriots will be trying to avoid the huge upset against winless Miami on the road next Sunday. Unfortunately for the Red Sox, The Indians were able to wrap up their series against the Yankees in Game 4 and weren't forced to use either of their 1-2 starting rotation punch in the process. Rather than pitching Sabathia the Indians chose to pitch Byrd and they pulled out the win. Because of this the matchup between Beckett and Sabathia is locked in. The season series between these two was 5-2 in favor of the Red Sox. Their last series was an interesting exchange as Dice-K pitched 7 shut out innings to get the win over C.C. Sabathia in a 1-0 win. Fausto Carmona would flip that on Josh Beckett and the Red Sox the following night in a 1-0 win for the Indians. In the last game between the two Julian Tavarez and Kason Gabbard were lit up for 9 runs, but the Sox put up 14 of their own to win the game. Early in the season Curt Schilling threw a 7 inning 1 run gem to get the win against the Indians. Beckett also pitched a solid 7 Inning 3 hits 2 ER performance early on in the year. What does all this mean? Any of the Sox starting 3 is capable of having a lights out performance against the Indians and Sabathia and Carmona are just as capable of shutting down the Red Sox. I would say that Sabathia and Carmona are slightly more potent than Beckett and Schilling, but there isn't a huge disparity. There is a larger disparity between Tim Wakefield and DiceK and the Indians 3-4 Westbrook (6-9) and Byrd (15-8). The fact that the Indians haven't had the opportunity to hit against Tim Wakefield this year should be an advantage to wake who can often throw off hitters who aren't experienced with hitting the knuckleball. This is a very evenly matched series, the sox will be lucky to advance to the World Series, but they have all the tools necessary to do so. The Cowboys-Bills game on Monday Night Football last night was absolutely ridiculous. Tony Romo, the head of one of the most prolific offenses in the NFL right now, threw 5 interceptions and lost a fumble for good measure. Romo was playing this game like he had bet his salary for the next 10 years on the Bills. Finally, Romo scored a TD and had the opportunity to tie with the 2 point conversion, but instead TO dropped a really good pass in the end zone, but who needs the two points when you can just get 3 for a FG? Dallas successfully converted an onsides kick, got to the brink of their kickers FG range and their kicker put it through the uprights not once, but twice after the Bills coach pulled off the trendy "last second timeout to ice the kicker" trick that everybody seems to be trying these days. The kick was dead on and had the distance as time expired. The one thing the national media and ESPN seem to be glossing over is just how astoundingly bad the Bills offense was this game. Their defense and special teams put up 21 points and 6 turnovers total and they only had one scoring drive, a FG, to supplement that score. They even threw an interception deep into the red zone where a FG probably would have locked up the game on for the Bills. There were so many times where any life from the Bills offense would have put the nail in Dallas' coffin but they just couldn't deliver. I took an active interest in this game as the Patriots are headed down to Dallas to take on the Cowboys this coming Sunday and the Pats will be seeing the Bills again in week 11. Personally, I feel much better about both of those games after watching this game. Dallas' offense isn't as sharp as it seemed and they probably aren't in the same class as the Colts and Patriots. 3 posts for the price of one: EVERYBODY WINS! This was a fruitful weekend for Boston sports as the BC Eagles advanced to 6-0 against Bowling Green University, The Patriots moved to 5-0 against the Browns and the Red Sox swept the Angels and await the winner of Cleveland-Yankees in the ALCS. "His job is on the line," the owner was quoted in Sunday's editions of The Record of New Jersey. "I think we're paying him a lot of money. He's the highest-paid manager in baseball, so I don't think we'd take him back if we don't win this series." Could this be the end of the Joe Torre era in New York? Dare I say a "rebuilding year" for the Bronx Bombers? I personally hope so. The New England Patriots cruised to another easy win to improve to 5-0 in a 34-17 win at home over the Browns. The Patriots seemed to almost lose interest in a lethargic third quarter that broke an impressive streak of consecutive quarters with points scored and allowed the Browns to almost sneak back into this game. Tom Brady had his least impressive performance so far this season and was supported by an impressive showing by the defense as it produced 3 interceptions (2 by Junior Seau and 1 by Asante Samuel) and a fumble recovery and return for a Touchdown in the last minute of the game by Randall Gay. The Patriots first real test will come next Sunday in Dallas as they take on the 4-0 Cowboys. (looking good to become 5-0 against the Bills on MNF) If they win this game in the same easy manner they have cruised through team after team this year expect the 16-0 talk to reach a whole new level. That said I have no expectations that Tony Romo and one of the most impressive offenses in the NFL to roll over even with the Patriots defense being as solid as it has been. The BC Eagles rolled to 6-0 after a strong 55-24 win over Bowling Green and amazingly to it's highest ranking ever at #4 in the country in both the USA Today, AP and Fan Polls. USC and Wisconsin dropped in the rankings after losing to unranked programs to make room for the Eagles move up in the rankings. USC broke it's 35 game home winning streak by losing to Stanford in a 24-23 stunner. 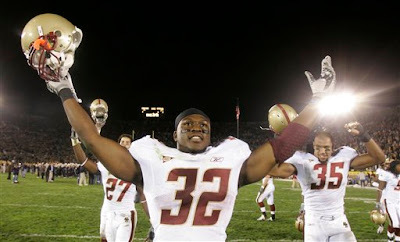 Stanford was fittingly the last team to beat the Trojans at home back in 2001. Matt Ryan added to his Heisman credentials with a solid line: 24 catches/32 attempts, 312 yards and 4 TD passes. The cream puff portion of the schedule has been extended by one game as the Eagles will head to South Bend to take on the 1-5 Fighting Irish who managed their first win of the season over UCLA on Saturday. Hopefully this isn't an indication that the Irish have gotten their act together. BC will try to hold off the upset for another week before the 5 conference games that round out the schedule for the Eagles. The conditions seemed right for an upset. A very talented team playing below it's potential at home with a chance to silence all their critics by beating the highly touted Patriots. The feature back Laurence Maroney would be on the sidelines for this game. I would have been surprised by a Bengals win, but not blown over. The Patriots aren't the type to let that happen though. They're smart, well coached veterans with ice water in their veins who've heard enough "Any given Sunday" speeches in their careers to know not to look past any team in their way. This is why the Patriots get the 16-0 talk instead of the 4-0 Cowboys, 4-0 Packers and even the 4-0 defending champions the Colts. There is one point of concern however. The Patriots opponents so far have been soft. All four of their opponents are 1-3 after week four. The one "good" team they've played, San Diego, reached a new low last Sunday with an embarrassing loss to the lowly Chiefs and fell to 1-3. Maybe Marty always choked in the playoffs and that wasn't good enough for San Diego, but at least he got there, something current Chargers head coach Norv Turner is having trouble with. 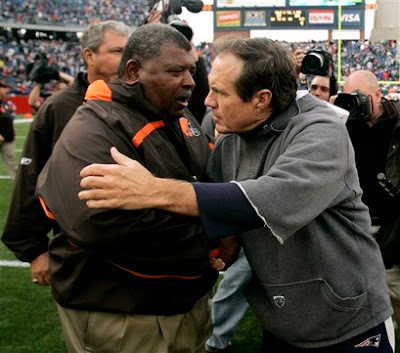 Next week's matchup brings our old friend Romeo Crennel back to Foxboro with his Cleveland Browns. The Browns have managed a respectable 2-2 but have been inconsistent after being blown out by Pittsburgh to start the season and edged out by the Raiders in week 3. Their wins include an impressive win over the Ravens this week and the 51-45 fireworks display with the Bengals in week 2. Romeo is the Patriots former defensive coordinator and no doubt will have some insight into cracking the Patriots defense.